RogerBlazic.com: Key To Life And Success Hidden In Blue Man Group Song - "Time To Start"
Blue Man Group with the Key To Success. Literature, poetry, art and music often have metaphoric meanings. We all spent hours analyzing great books in school to get at the meaning behind the story. A short time ago, when I was off of my medications for a week, I had a sudden inspiration regarding one of my favorite songs by one of my favorite performance art and musical acts. I discovered the key to life and success is hidden in the Blue Man Group song Time To Start. On the surface, Time To Start seems like a whimsical and comical piece of musical satire. Accompanied by driving percussion and searing guitars, Time To Start takes you on a brief educational course of basic rock concert movements. After listening to the song for 36,283 times over the last five years, the true message of the song hit me. Although, that might have been an ice cube tray falling from the freezer, but I'm quite sure it was the song. Lyrics to Time To Start are sparse. However, the depth of meaning is unfathomable, once you grasp the concept. 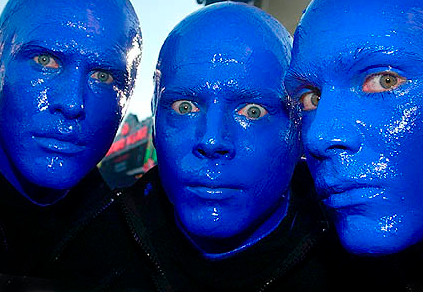 If you are not familiar with Blue Man Group, you MUST watch the video. If you skip it, something bad could happen to your computer. If you are familiar with the song, then you'll want to enjoy it again before I move to the analysis phase of this post. Enjoy Time To Start. When you Get to Movement #10, which comes before Movement #3, watch closely. I had Movement #10 done to me in Las Vegas at the Venetian while attending a benefit show and sitting in the second row. The inverted-colonoscopy saved me on a traditional exam, and I felt more confident after the free check by the blue men. Now that you've watched the video, I can begin the breakdown of the genius embedded in the lyrics of this song. The movements taught to you in the song will greatly enhance a rock concert experience, but they could also change your life, your career, your business or your family life; but only if you know the hidden meaning behind what Blue Man Group is communicating to you. Lyrics will appear in italics and the analysis below. If you're going to get anywhere in life, you have to start. You cannot get anywhere by forever pondering the next move. You have to start. You have to decide. You have to have an idea and make a decision to act on it. Rock concert movement #1 - The basic head bob. Once you've made a decision to act, you have to get your head wrapped completely around what it is you are doing. There should be immense movement within your head. Don't let the physical move trick you, it is really what goes on inside your head that makes a difference. Having the right attitude. Having a plan. Having a goal. All of these things happen in the head, first. Don't just sit there, GO! Go to the library. Go to Google. Phone a friend. Get info to fill your head with good things as you bob your head. Rock concert movement #2 - The one-armed fist pump. Mark Twain said it best, "With enthusiasm, you can accomplish anything." Get pumped up. Get excited. Get enthused. Clench your fist and believe in what it is you are setting out to do. Look in the mirror. Is your fist clenched and are you pumping your arm? If not, GO! Rock concert movement #10 - Getting a closer look at the audience. This is where a lot of people mess up. They go forward, but never check their audience. Notice that it is number 10, which means you repeat it at the end, too. Who is your audience? If you write, it is your readers; if you sell, it is your prospects and customers; if you sing, they buy your CD's or sit in front of you at a show - the people behind you are called "roadies" and like women more than you know. Ask questions, get feedback, do a survey, take a poll, listen for applause. What is your audience telling you? You need to know that, no matter what business or profession you are in. If you're a doctor and all of your patients die, you may have to pull out a few of the med books and brush up before your next appointment. How many questions have you asked already? Did you hear applause? Get off the couch and get feedback. Rock concert movement #3 - The up and down jumping motion. This means you have to put your entire being into whatever it is you are doing. No half-assed effort. No sleeping in. No wimping out. You cannot waiver. You have to jump into the air with all of your might. Gravity will always bring you back down, so leap without fear that you will soar through the clouds and off of the planet. Jump. Jump. Jump. Do I need to say more? This is the part of the journey that separates the players from the posers. If you're ready for the next movement, then GO! Rock concert movement #4 - The behind the head leg stretch. If you're going to be truly successful in life, you have to do the move that no one else is willing to do. You have to do the behind the head leg stretch. You have to go beyond what you think your body and mind are capable of. You have to live with a mindset that there are no limits to your abilities and to your willingness to work hard and stretch to get what you want in life. You do this with your business, your career, your children, your spouse, your family and your friends. Blue Man Group website - Ready go! Blue Man Group Is Best Show In Vegas. The Beat Of A Different Drummer.